Support for GSEIWI Camps - SOS Camps! Save Our Girl Scout Camps. I’m 10 years old and I’m in fifth grade. I’ve been a Girl Scout ever since first grade. When I was in third grade, I went to Camp Conestoga for one night with my troop. It was so much fun. When I was in fourth grade, my same troop went to Camp Conestoga for the day, to do the ziplLine and canoeing. I had a soccer game that same day, so I was pretty bummed that I wouldn’t be able to go. But then my mom told me what time my game was and that since Camp Conestoga was only about 30 minutes away, she would be able to drive me out to meet my troop after my soccer game was over. I was so happy because I didn’t have to choose between my soccer game and my Girl Scout friends! When I got there my troop already started doing the zipline. Good thing I got there when I did, because I was just in time to be the last person to go ziplining from my troop! I loved it a buch! Then my troop went canoeing down at the camp lake. One of my best friends, Kaighin and I were partners. It was pretty scary, I was glad that Kaighin and I were partners, because she was really tough and I was really tough to help each other when I was trying to get back in the canoe. She helped me, and when she got her oar stuck in the mud, I helped her get it out. I also went to Camp Conestoga for the day, a few weeks after my school troop did. We went horseback riding and we played on a slip and slide. It was so much fun. Please keep the Girl Scout camps open so that not only I but others girls can go to camp also and have the great adventures I had. The Quad-City Times recently published an editorial titled “Sacred memories vs. real estate,” (March 19) that stated “no one can accuse the (Girl Scout) regional council’s board of trying to pull a fast one.” Here is some background that will demonstrate the lack of transparency demonstrated by the Girl Scouts of Eastern Iowa and Western Illinois leadership. Since council realignment, CEO Diane Nelson has attempted to close camps. This was first demonstrated two years ago when leadership attempted to close Camp Tahigwa with no consultation or discussion with the council. Thanks to a letter-writing campaign, this didn’t occur. Many members of the property committee and the board of directors have not visited all the camps, nor sought sufficient feedback from council members about the camps. The council continues to misrepresent the data. Ms. Nelson’s letter on the closing of the camps stated “the girls have voted with their lack of participation at camp,” yet their own reports state camp usage has gone up. Council members have attempted to engage GSEIWI leadership on alternative strategies to maintain the camps (fundraising attempts, partnerships with conversation groups, etc.) that Ms. Nelson has refused to discuss.The board is disproportionately comprised of members from the Quad-City area. Only 3 of the 25 are from the former Conestoga Council and home of Camp Tahigwa. Without adequate representation on the board, how can areas with camps represent their Girl Scout community they are meant to serve? Camp Conestoga has always been one of my favorite places. It breaks my heart to hear they’re considering selling it. Someone said today’s girls won’t take the time to put down their cellphones and iPads for a few days sleeping in some old cabin in the woods. Frankly, I believe they’re missing out on a great experience. I’ve met so many great people at camp who’ve had such an impact on my life. There was one year when my two counselors were both from Ireland — one from Northern Ireland and one from the Republic of Ireland, one Catholic and one Protestant — and they got along like best friends! They taught me that stereotypes are worth nothing. I fell in love with horses at camp. I’ll never forget the first horse I rode. Her name was Ida, and she was a gift to Conestoga from “Happy” Joe Whitty. She was given back to him after she got too old to carry kids, but she’ll always be my favorite horse. I ask the Scouts in our area to take a chance. Put down your gadgets for a few days and get outdoors; and you’ll make memories and friends that will last a lifetime. To me, that’s worth more than any piece of technology. Camp Conestoga, you’ve surely passed the test for the camp I love the best. You’ll always be our Girl Scout camp, our Camp Conestoga. The Girl Scouts of Eastern Iowa and Western Illinois are proposing selling the last four remaining camp properties in Iowa. In discussions with board and property committee members I have been asked, “Isn’t it our job to help girls of today build their own new memories, not memories that you have?” This is in response to impassioned pleas to keep the camps open from alumni whose past camp experiences have been extremely influential and beneficial. To these members I would ask if they would also recommend that a happy family decide to divorce, move the children, and then work at building new and happy memories. Why would anyone assume that new memories are not connected to our past? Ask any amnesia victim who has to build completely new memories, and I believe they would gladly remember the past. Additionally, the GSEIWI proposes selling the camps, and then doing a feasibility study moving forward. It would seem that a feasibility study should be done before advocating the sale of all of their property. It doesn’t make sense to dismantle history, especially before there is any plan for how to move forward, in order to create new memories. New memories are based in one’s history. To divorce just to create new memories is ludicrous. I would like to express my concern about the potential closing of several Girl Scout camps in Iowa and Illinois. Research clearly shows that involvement in outdoor activities is associated with better physical and mental health. Children who are active in nature are less anxious, angry and depressed. Children are losing opportunities for primary experiences, where they can see, feel, taste, hear and smell the natural world for themselves. Children who engage in rigorous exercise have lower rates of ADHD and depression, and higher academic performance. Nature is where children can obtain multi-sensory experiences that stimulate their imagination while gaining exercise and building friendships. I understand children’s interests are changing. However, as adults we need to lead children to the things we know are in their best interest. We want to build a generation that visits our national parks, cares about the environment and appreciates the critical balance between mankind and nature. I would encourage the Girl Scout Council of Eastern Iowa and Western Illinois to consider reducing the cost of their redesign with simple additions, such as adding cabins and flush toilets. Find church youth groups and junior and senior high school environmental clubs to use these cabins. Build incentives for local troops to utilize the camps. Seek additional grant funding. I highly recommend books by Richard Louv and John Ratey for research on these issues. I hope these camps are available for the next generation. Imagine a world without Girl Scout camps. Protect this great program for future generations. I’ve witnessed girls who come to camp concerned that they won’t know anyone to leave with lifelong friends, girls who don’t fit in at school, find her clique and finally have a place in life, young girls terrified to say hello only to stand in front of 100 people days later leading them in grace or song. I’ve had the pleasure of watching girls come to the horse corral afraid to stand next to their horse only to find them hours later hugging them goodbye and kissing their noses, troops that can’t decide what to cook for lunch but manage to use teambuilding skills to successfully complete the ropes course. My list wouldn’t be complete without sharing the girl terrified of heights conquer her fear, strap herself into a harness and zip line across the woods. Every day a girl spends at camp, away from the stress and pressure of “Girl World” is a day she finds the courage to step outside her comfort zone and realize her true potential, a day she displays the confidence in her decisions to stand up for what she believes in and is the best example of character that anyone could ever hope to have in a child. They walk away with leadership skills guaranteeing them to be the person that will make the world a better place. Mission statement is wrapped up in one program — CAMP! I am very disappointed that the local Girl Scouts organization has recommended selling all four Eastern Iowa camps. I attended Camp L-Kee-Ta for several summers when I was young, and even then it was not “modern.” The fact that the Girl Scouts and their parents are not pushing for an outdoor experience for young women is quite disappointing. The skills and general education about life without convenience that I learned there have come in handy more than once in my life. With the deterioration of our general health because of so much indoor activity, as well as the physical problems brought on by the use of computers and other electronic equipment, a week in the woods without those things would be a good thing for most young people. We are not separate from the world around us. We are part of it, and nature is not plugged in. I am writing this letter in regards to our Girl Scout camps in our area. I want to say that was my finest time of my early childhood. I was able to learn very valuable lessons for later on in life. My family was very involved with the Conestoga Girl Scout Camp. We would always work out there getting the camp ready in the 1960s and ’70s. My whole family helped me sell enough cookies to get my camp for a week paid-in-full. I was a leader for my daughter and worked to get her to camp. She was a counselor and met many friends from England and Australia who worked there for the summer. They still are friends to this day. The news of the impending closing made it to them and they were saddened. They hoped to come back some day and visit. My daughter worked out there in the 1990s and she also learned many, many life lessons. I am saddened to think that my great memories of camping and the things I learned will not be able to be passed on to my granddaughters, Alexis and Klhoe. I hope the Girl Scout office rethinks their decision, and hopefully if they have to cut expenses they’ll look internally. I am writing to you to express my great sadness at the news the Girl Scouts of Eastern Iowa and Western Illinois property committee is recommending the closure of all four of their camps. Both of my daughters attended Camp Conestoga over many years, and one continued on to be a counselor there. The skills they learned by attending and working at camp have made them both the successful career women they are today. The respect for nature and conservation, the opportunity to swim and canoe, the passion they share for inclusion and diversity, the survival skills they learned to live off the land, and the friendships they share to this day, all came from the experience of Girl Scout camping. Closing these camps in order to purchase a modern outdoor center in another location makes no sense at all. These camps are outdoor centers and have been providing valuable life experiences for Girl Scouts in our area for many years. Scouting is all about the experience of going to camp, meeting new friends, and experiencing the outdoors. If you have daughters, granddaughters or nieces who are past, present or future scouts, please make your voice heard by calling the Girl Scouts of Eastern Iowa and Western Illinois office, visit the website at saveourgirlscoutcamps.weebly.com or email the property committee atproperty@girlscoutstoday.org. Save these camps before it’s too late! It was disappointing to read "Collaborative vision for our camps has been achieved," when in fact the membership was not welcomed or even invited to attend the March 28th "working" board meeting. Furthermore, at that CLOSED meeting, a presentation was delivered "which provided the board with a comprehensive assessment of opportunities associated with a re-imagined camp and outdoor experience." As a registered member of Girl Scouts of Eastern Iowa and Western Illinois, I would liked to have been privy to a presentation which resulted in a recommendation not all that different from the original of Feb. 5th. After all, the word divest does means sell. This represents a serious concern. The land for these camps was donated -- to the girls of this Girl Scout Council -- for future generations of girls. I hope the council will be open to ideas from the membership who formed Save Our Girl Scout Camps, many of who are original STEM girls -- before the acronym was coined -- working today as professional women in STEM careers. Let us work together to revitalize and to restore full operation to all four camps in this 38-county, bistate Girl Scout Council. Vote NO to the "new" Property Committee recommendation at the Thursday board meeting. Bring it forth in two weeks at the April 25th Annual Membership Meeting. Allow the membership to VOTE on what happens to the property that was donated and owned by the membership. What is the darn hurry anyway? I have serious concerns about what's happening to Camp L-Kee-Ta. How can the Girl Scouts of America sell off land which was donated (in perpetuity?) by the Elks, for the specific purpose of providing a camp for our girls? Camp L-Kee-Ta is some of the last publicly accessible land left (non Girl Scouts can rent the facilities on off days.) With absentee land ownership becoming the norm and everything posted now days it's difficult to even find a spot to hunt mushrooms. Primitive camp is an excellent opportunity for kids to put down their iPods for a few hours, associate with their peers, and learn some survival skills. Ask any of the alumni of the camp (moms and grandmothers now) they're apt to tell you that their time at camp created some of their most precious and vivid memories. Having been negatively affected by corporate avarice, I can't help but see similarities in what happened at the paper mill in 2005 and what the Girl Scout council is doing now. When International Paper Corp. bought the mill the spiel was that we would be part of a large conglomerate and would have more resources available to us; and we did, at first. Then, as the news reporting died down, they started telling us how inefficient we were and began cutting funds. They kept telling us we had to be more productive or they were going to shut the mill down; the more product we put out the more they required; after making amazing progress (the last day we were allowed to run we set yet another new production record) they shut the mill down anyway. There never was any plan other than to shut us down. What's happening at Camp L-Kee-Ta feels like déjà vu. As a former volunteer there, I know that camp L-Kee-Ta is in excellent condition; there are different options for camping in the rough, such as the cabins, really cool tree houses and of course tents. For the less stout of heart there's indoor climate controlled sleeping quarters. The lodge has a kitchen suitable for a busy restaurant. Activities include swimming in the beautiful pool, archery, stargazing, and hiking. Horseback riding on the trails (the absolute favorite) was one of the first things the council cut. What I read on the internet cites dwindling attendance. I wonder if that isn't exactly what the people in charge want. When you cut important programs and resources attendance tends to drop off. The more the attendance drops the greater the excuse to sell the place. I can't help but think that this was a done deal long before any information was ever disseminated to the girls and their families. I know that there's probably nothing we can do (the Girl Scouts are a sovereign entity, ruled by a council) but I feel like I should try; this beautiful old camp is a unique, affordable, and irreplaceable resource for the people of this community. Once this land is sold it's gone forever. I don't know the current plan, but I do know that eventually the money will be spent and this developed land (currently paid for and tax exempt) will likely be in the hands of some corporation, inaccessible to the local population. At camp, girls learn to haul buckets of water, safely use shovels and tools, get muddy, teamwork and be strong. When rivers flood, girls pitch in to help clean basements and fill sandbags, because they learned they can at camp. Rustic camps provide opportunities for girls to learn a progression of skills. Watching videos is not the same educational experience as learning outdoors. Younger campers learn to prepare for adventure trips through overnights, finding shelter, latrine, firewood, food and water. When teens and adults go backpacking on scenic trails or canoeing in the Boundary Waters, there are no facilities with indoor plumbing or air-conditioning. Girls with an appreciation for the outdoors become leaders and protectors of our environment and parks through politics, business, education and conservation. Rustic camps teach awareness of life in other cultures, and preparation for combat military service, where rustic life is a way of daily life. In tents, campers listen to birds and insects, not cell phones. While hiking, campers sing and discover colors, sounds and textures in nature, without wearing headphones. Campers dig natural clay for making bowls and crafts, without computers. Girls imitate how a hawk they just saw glides and dives, without video games. Campers exchange hand-written letters on natural paper they made, not emails. Camp means fun, friendships, exploration, discovery, swimming, horseback riding and so much more. With a renewed focus on camping in budgeting and fund raising, training, staffing, properties, marketing and programming, our camps can be saved. The Board of Directors of the Girl Scouts of Eastern Iowa and Western Illinois is considering the sale of the council's four remaining camps, including Camp L-Kee-Ta. Or will they only vote to sell two? Once again the membership is being kept in the dark. The council insists the camps must be updated with modern amenities, including flush toilets, air conditioning, and wi-fi, and that the money is not there to pay for these upgrades. All of the camps already have some of these upgrades, yet the council has been unable to provide any information to the membership as to how much it would cost to finish upgrading each camp. The membership has been told that the camps must be self-supporting, yet the council can't explain why. Historically, the camps have always been subsidized, as they are part of the Girl Scout program and not just a piece of real estate. If all four camps are sold, there is talk, but no promise of a centrally located outdoor center. If only two camps are sold, that leaves two camps to serve girls in a council that spans 38 counties. Either option leaves year-round outdoor Girl Scout programming severely restricted, at best, for many of the young Girl Scouts in our council. We teach girls to honor the Girl Scout promise and follow the Girl Scout law; the council leadership and board should live by these words as well. As a former board member of the Conestoga Council of Girl Scouts, as well as former camper, camp counselor, and camp director of Camp Tahigwa, I am astonished, disappointed, and dismayed by the leadership of the Girl Scouts of Eastern Iowa and Western Illinois (GSEIWI) Council. Camp Tahigwa is one of four Girl Scout camps that has been recommended for closure by the GSEIWI Property Committee with support by chief executive officer, Diane Nelson, and seemingly little resistance by the board of directors. I am astonished that many of the people on the property committee and board of directors have never visited Camp Tahigwa. 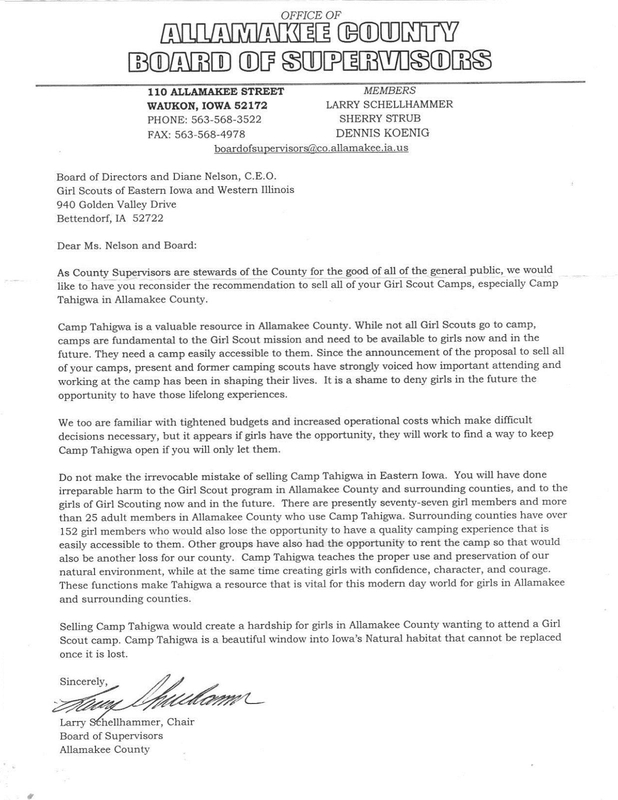 I am disappointed that the board of directors and Nelson have not demonstrated a transparent decision-making process, have not engaged the dedicated Girl Scout community of Iowa and have resisted conversations on alternative ways to maintain the camps. The leadership is attempting to make a decision without regard for the generations of families that have volunteered, developed, built and continue to love the camps. This is not how the former board of directors of Conestoga Council used to make decisions or treat its Girl Scout community. It seems shortsighted to sell the camps because of a one-year decrease in use when there could be a commensurate increase in the future. Camp Tahigwa no longer has horses. Bringing horses back might increase use at that camp. I wonder what is being done to develop and promote programs for the camps. If programs girls love (like the horses) are discontinued, of course camp attendance will decline. I encourage the board to develop a vision and implement a plan so future generations of girls can attend camps. Tahigwa is located in Allamakee County, one of the most remote counties in Iowa. Its beautiful lands offer rugged, hilly terrain, as well as a sparkling stream. This camp could offer challenges to older campers whom they couldn’t find at other camps. It would be a great destination for longer adventures. What camp gives to girls is almost impossible to quantify. It helps girls develop many of the qualities they need to become strong, competent, capable women who excel in their personal and professional lives. Girls build new relationships with themselves and others. They learn leadership and organizational skills. They learn to depend on and trust themselves, as well as to work with others. They experience the joys of exercise and of being at one with nature. Staff members also benefit from the camps. As a teen, my sister worked at Tahigwa. When the kitchen supervisor resigned midsummer, my sister applied and was told she was too young. The person hired never showed up, and my sister ran the kitchen for the rest of the summer. She learned incredible leadership and organizational skills. During a recent job interview, she cited her camp experience as an illustration of leadership skills. I ask the Girl Scouts’ board of directors to re-evaluate plans to close/sell the camps. Selling the camps may be a permanent solution for a temporary problem. While it might not be irrevocable, it certainly would be difficult to get back what was sold. CLINTON — Girl Scouts of Eastern Iowa and Western Illinois announced a little over a month ago their intention to close and sell all four of their resident camp properties. As a summer camp advocate and former Little Cloud staff member, I know the importance that having a summer camp experience provides to girls in the tri-state area. It gives girls the chance to be independent of their families, try new things, work as a team, and best of all, HAVE FUN! The council states that “we will always have camp,” yet they do not have a solid plan in place for what will happen after the 2013 camping season. Does it make fiscal sense to sell properties that we already own to buy prime real estate and build a new outdoor center? Instead, we should invest in the properties we own and make them destinations that all will want to use. Little Cloud has been a part of the greater Dubuque community for over 65 years. Local girls (and parents) want local camps connected with the traditions that they hold near and dear. The council's research states this, yet we are all too ready to build a new center that is not local for a majority of the council. I agree that Girl Scouts needs to change with the times, but this doesn't necessarily mean we need a haven with wifi and climate control. We should preserve traditions and the camp experience as well as look towards the future. I lived in Decorah from 1969 when my dad, Pat Maloney, took the job of editor of the Decorah Newspapers, until I graduated in 1972. I still consider Decorah my hometown. Much of what I have become and enjoy in my life came from joining an amazing and active Girl Scout troop in Decorah. I learned my future career from Joyce Johnson, one of my Girl Scout leaders, and I have been a physical therapist now for 38 years. I learned to camp, canoe, hike, ride horses, tie knots, sell cookies, etc. from Girl Scouts, and especially remember Jack and Marge Thompson and Blanche Overland as very active leaders. We spent many days at Camp Tahigwa, and I was so sorry and shocked that it was scheduled to close due to lack of use, lack of funding, etc. My daughters were raised hiking, skiing, camping, sailing, riding our horses, riding bicycles and dirt bikes, and, yes - selling those Girl Scout cookies. Being in the outdoors, even in the challenging climates back there in Iowa, is an excellent way to spend time, and at Girl Scoutcamp, many life-long memories and friendships are made. I still downhill ski, go backpacking in our mountains in summer and in the winter with snowshoes or backcountry skis, canoe, kayak, remember how to start a fire, be prepared in all situations and remember the Girl Scoutprinciples. Let us hope that Camp Tahigwa can stay open to offer a new generation of girls all of these opportunities. By Wendy Dibert, Caledonia, Minn. I could fill a book with what my experiences at Camp Tahigwa meant to me, and how much I have learned from them. However, the Girl Scouts of Eastern Iowa and Western Illinois have proposed selling all four camp properties in the council. The stated reason is decreased interest in camping, but from 2008-2012 there was an overall increase of 33 percent in camp facility usage. A study by the council states that, "Overwhelmingly, the girls say they are interested in camping..." The council leadership has lost appreciation for traditional camping, as well as the drive to see it succeed. We should be encouraging outdoor programming, yet I see the opposite happening. Sixty-five percent of families learned about camp through mailed brochures, which the council stopped sending. Our camps have been set up for failure through reduced programming, and decisions which go against the strengths of each camp. More than the council's misleading information, and even more than the lack of plans in place for after selling the camps, I think of the future. Natural spaces are diminishing as more land is developed, and selling properties is permanent. There is no other way to truly understand the natural world than to be in nature. We do not need to sell properties, we need a council who supports outdoor programs, encourages use of properties and allows them to run according to their strengths. Please help save our camps - for the girls of this council and the future of Girl Scouting.